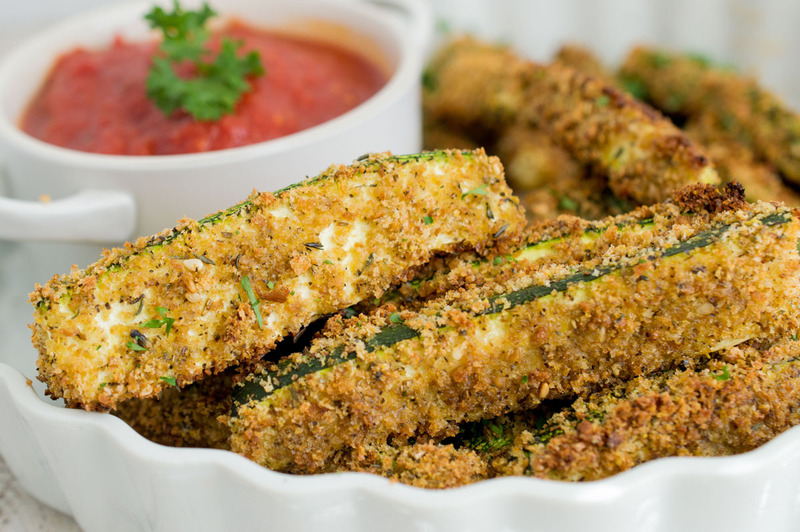 Kids and adults alike flip for these zucchini “fries” —they’re baked in the oven, with a flavorful breadcrumb topping that’s just as delicious without the extra calories of fried foods. The secret to the amazing flavor? Garlic Gold® Herbs de Provence Nuggets are combined with a couple slices of whole wheat bread to make garlic and herb-flavored breadcrumbs. Oh, and we add a little nutritional yeast for an extra savory flavor (but parmesan cheese would work great too if you’d like to use that instead). You can’t find breadcrumbs like this in a store — they’re fluffy, fresh, and full of roasted garlic flavor, and they make the perfect topping for these zucchini fries. 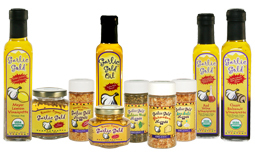 You can also use them on baked fish or chicken, if you like! Just drizzle on a little Garlic Gold® Oil and bake away. When the fries are hot and crispy out of the oven, serve them with a bowl of marinara sauce alongside and dip away! 1. In a food processor or high speed blender, combine the wheat bread, Herbs de Provence Nuggets and nutritional yeast. Process in quick pulses until the bread has become coarse breadcrumbs, and the nuggets are blended in evenly. Transfer the mixture to a shallow dish or pie plate and set aside. 2. In a small mixing bowl, whisk the egg and water until the yolk and white are blended. 3. Line a baking sheet with parchment paper and preheat the oven to 425ºF. 4. Dip the zucchini sticks into the egg mixture, a few at a time, then use a slotted spoon to transfer them to the dish of bread crumbs. Toss to coat evenly, then place the breaded zucchini in a single layer on the lined baking sheets. 5. Drizzle the coated zucchini evenly with the Garlic Gold® Oil , then bake until golden brown, about 25 minutes. Serve hot, sprinkled with chopped parsley and with a bowl of marinara sauce alongside.